With that in mind, we first wanted to do a brief update on the national payer landscape. But we are also featuring a couple of highly regarded speakers from the payer world at our next ConvUrgentCare Symposium January 22-24, 2018, in Scottsdale. What happens between now and the symposium in the U.S. health insurance markets could amount to big changes. Understand how payers view and are influenced by the government programs sector – this tends to have a strong trickle-down effect on the commercial insurance sector. Understand what’s happening in the commercial sector – this is where most of your patients will be covered and where most of your revenue will come from. Understand the payers as potential competitors. According to John Gorman, founder and CEO of the Gorman Group, there are three main stove pipes to government programs: Medicare, Medicaid and Obamacare. From a payer perspective, Medicare is where the action is, and specifically Medicare Advantage plans is where all of the payers have focused their energies. Gorman is considered the guru of the government payer landscape. And he will be one of our featured speakers at the symposium in January. That leaves Medicaid and Obamacare as the two remaining stove pipes. The ACA continues to linger and may yet possibly survive, there being at least one carrier in most markets, but the realities are not pretty. And Gorman says these are not exactly where payers are flocking, at lease right now. To support Gorman’s “black clouds” view, an op-ed in the Wall Street Journal this month by Centers for Medicare & Medicaid Services (CMS) Administrator Seema Verma strongly indicated the Trump Administration plans to lead government programs in a new direction. But Gorman says walk-in medicine is ironically a significant part of the thinking for anyone participating in government programs. The commercial segment is going to be relatively flat for the coming decade based on macro-level population trends. The off-exchange business and large group commercial will continue to perform. Managed care rates continue be a central focus of every operator as deductible structures continue to grow and alliances shift. The changes taking place at plans should be a wake-up call to keep innovating and making investments in your organization’s sophistication, scale, and payer acumen. We are starting to see the payer camp split into those that really embrace the potential of the walk-in sector, and those who don’t. But Gorman’s point about how strategic walk-in medicine is in the government programs sector carries over to the commercial sector. And recent earnings announcments from the big, publicly traded health systems (CHS, Tenet and HCA) made clear that walk-in medicine is one of the biggest areas of focus. Samual Hazen, president and COO at HCA, said it best: "We clearly want the lower acuity business somewhere in our system. That's why we're investing heavily in urgent care, and we continue to invest in freestanding emergency rooms, because it allows us to develop a relationship with our patients and ultimately integrate them inside the HCA system." HCA acquired Dallas-based CareNow in October 2014 and has since expanded the CareNow footprint into what is legitimately one of the largest national urgent care platforms. Recent research from the Health Care Cost Institute shows that out-of-pocket consumer spending for healthcare services continues to grow. 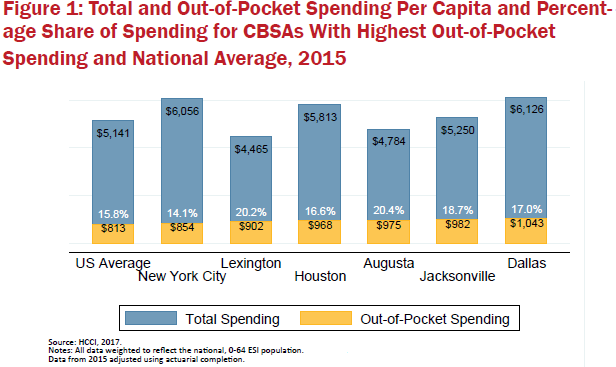 The chart below shows per-capita spending in some major metropolitan areas reaching past $1,000 per year. The commercial health insurance market is not growing, but walk-in medicine is. These out-of-pocket dollars represent the first dollars toward a member’s deductible. And we clearly see health insurance companies going after those dollars by investing in walk-in clinics. UnitedHealthcare, Centene, and Kaiser Permanente continue to grow and innovate, and walk-in medicine is part of their thinking. With the Anthem/Cigna and Humana/Aetna mergers having died, these firms have to get back to the mundane requirements of having actual corporate strategies. We expect them to be looking at the walk-in space as well. In fact, Cigna has a medical group that operates walk-in centers in Phoenix already. And back to Gorman’s comment about the member experience. Unlike most health systems, insurance companies have been paid based on Star Ratings and member experience scores now for some time. We will save a more detailed look at Star ratings for a future report. But it should be noted that many organizations – regulators, plans, health systems, policy groups – are now using Stars as a proxy for managed Medicaid and exchange membership. Typically providers and operators don’t treat patients differently based on their health plan, so there tends to be some reliable consistency across scoring mechanisms. The health plans that are sub-four stars have lost their bonus, and it is creating an arms race to get back to four or better Star ratings. Let’s take a quick look at several of the largest health insurance companies. The chart on page one shows each plan by membership, with UnitedHealthcare clearly leading the pack with 70 million members. UnitedHealthGroup has had a phenomenal strategy in place for years. They are a force in the self-funded market (large employers) and they have the AARP contract on Medicare Advantage. They’ve ended Harken Health and re-focused where they have scale and focus. It has built a technology and platform services powerhouse (Optum), selling those capabilities to hospitals and other payers. They have over 1,000 consultants, just purchased the Advisory Board, and do everything from write coding books to running one of the largest health savings banks, to running large medical practices. MedExpress is one of their platforms, and Optum acquired Surgical Care Affiliates in Q1, one of the largest ambulatory surgery center operators. We will be featuring Tom Beauregard, EVP/Chief Innovation Officer at UnitedHealth Group, as one of our keynote speakers at our next ConvUrgentCare Strategy Symposium. Beauregard drives UHG’s innovation efforts at the highest level of the company and oversees a portfolio of diversified assets and high performing teams. He will address how they continue to deliver value year after year, how UHG views the payer and provider markets, and how he believes you should be looking at disruption and technology over the next few years. Clearly, the MedExpress acquisition was a clear signal to the market that UHG values the walk-in sector. To get a sense of how UHG integrates these acquisitions across their portfolio take a look at how the company communicates with its brokers and consultants about MedExpress. This link brings you to promotional kits that outline MedExpress benefits to employers. UnitedHealth gets criticism from some operators for having low rates in certain markets, although we have seen huge disparities in net allowed rates. Much of this can be attributed to the provider group lacking sophistication or market leverage. UHG is capable of knowing everything about the local market. As an operator, if you are not additive to their platform or strategically important, you aren’t going to get great rates, or even be put in network. UHG can better control the experience and costs for its employers and members by using its own resources. Check out their very polished, easy to use/promotional marketing with their health benefits brokers/consultants. Anthem is a collection some 13 or more BCBS plans and is publicly traded as a for-profit entity. Anthem is a part owner in a large urgent care chain called Physicians Immediate Care out of Chicago. Ironically, Chicagoland is not where Anthem writes the bulk of its business. Anthem also has an interest in the CareMore Medicare Advantage platform, a team-based care platform coupled with a top-rated Medicare Advantage product. We believe many urgent care operators ignore Medicare Advantage to their own detriment. Anthem has been a major boon to the urgent care sector. Recent efforts require accreditation for urgent care centers as part of payer contracting. This is great for accreditation platforms like the UCAOA but a burden for many urgent care operators. Anthem now says members are responsible for emergency room costs when it is determined that the event was not an emergency. Now that the largest Blue plan has gone in for this policy, we expect to see the other plans and government sponsored programs follow suit. This could turn out to be a huge volume driver for urgent care centers in general, and further impact hospitals. HCSC has five BCBS plans and is also a private company. It is one of the largest Blue plans with a mix of commercial and government membership. We suspect they will follow other BCBS ideas on urgent care given they run BCBS TX and IL, and haven’t been at the forefront of policy in those states. 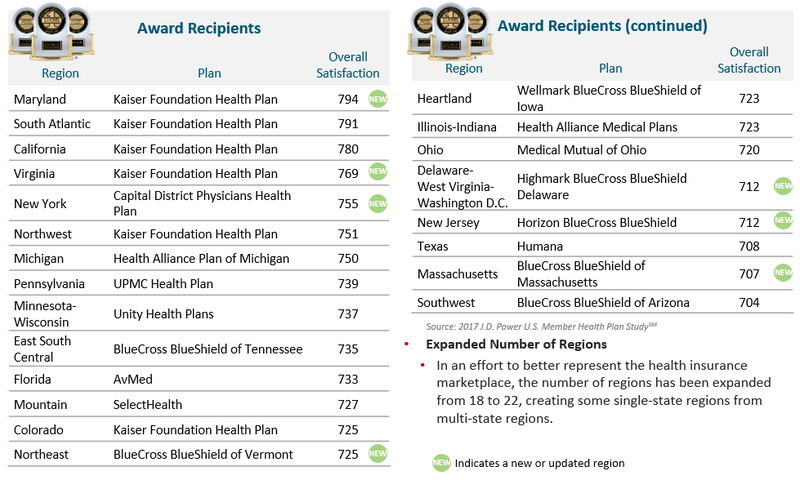 Highmark is another private Blue plan, now with five plans in the MidAtlantic. Highmark was an early investor in MedExpress but divested that interest around the time of the Optum acquisition. Highmark also acquired a health system in Pittsburgh and still has some urgent care centers in network. This plan is perpetually at war with UPMC, a much larger regional system with its own large urgent care footprint. The other BCBS plans are just as different in focus, although every one of them is trying to pivot to being consumer conscious and more provider friendly. Many Blue plans have added executive titles around Consumer Experience (CX) and are running CX transformation projects. BCBS SC (Doctors Care) and BCBS NC (FastMed) continue to have urgent care operator investments. BCBS MA (CareWell) has its platform investment, and BCBS FL and BCBS MN dabble. Aetna had some interesting options going into the ACA, but impacted many of its health system joint venture partners recently by pulling completely off the ACA exchanges (think sudden member declines for health systems). In hindsight, it might be harder than it appears to write high PPO rates with health systems when you jointly own the risk and don’t majority-control the provider operation. It has no clinical operations, but does have interesting technology platforms which could be a boon to the walk-in industry if they could execute on the vision. It had stopped focusing on Medicare Advantage with the Humana merger, but now needs to make up that ground on member base. All that being said, if Aetna took a long look at its operations, they should overhaul their JV program and go all-in to focus here as it is a true strategy leveraging their strengths. Cigna is another firm trying to find its footing after the merger split-up. It may make money in China or other international markets in the future, but for the most part it writes commercial large group plans, which isn’t a fast growing segment. Cigna still has a medical group in Arizona. To their credit, they do rank first on Athena’s PayerView report card (2016) for provider friendliness. In June it came out placing its bets against urgent care, and pushing CVS MinuteClinic as the end-solution for most routine episodic acute care. Humana is doing some impressive things, including coming out with innovative provider integration models. It is custom building clinics with Iora for Medicare Advantage members, and is the largest health plan operator of retail stores. It has gone “all in” for Medicare Advantage and serious urgent care operators should be looking to support Humana in its goals here. Centene is an impressive high-growth publicly traded company ($8B to $46B+ in 5 years), serving some 28 states under a number of state-level Medicaid, Medicare Advantage, and commercial brands. They have a low rate structure and government contracting expertise. They acquired HealthNet in California last year. If urgent care operators are seeing 10-40 percent of their volume tied to Medicaid, this is a sector to watch closely and get your strategy in place. Given Centene’s sophistication, government relations, rate structure and lean operations, they are actually entering ACA exchanges while others are fleeing – and they’ll make money at it. This government sponsored sector is growing, it matters to the walk-in sector, and likely to dominate the national healthcare landscape in the future. Kaiser is an enigma to the walk-in sector. It is the classic HMO, vertically integrated and top performing year after year in satisfaction studies. It has numerous urgent care centers (24 hour urgent care no less, paying higher wages for great staff). Merchant Medicine hasn’t traditionally tracked this firm due to those centers really being part of a medical office building group practice, and not advertised as open to the general public. That’s changing with a new product line called Care Essentials, with a first clinic in the northwest designed to serve non-Kaiser members. Any operators with Kaiser Permanente in their market should pay careful attention. KP has more money, time, and patience to grow and develop a world class platform than anyone else. Their pricing and engagement process are pretty straightforward. KP has one of the lowest churn rates for members in the health plan industry – members prefer to stay. It is a great value proposition, they aren’t going to be acquired anytime soon, and they have a culture built on patient care (not claims processing). This clinic platform is to introduce members to KP, and win them away with great care options at low prices in an easy to use setting. Or at least we’re guessing it is something like that. Newer PostPrimary Care In an On-Demand World: Is the Primary Care Physician Making a Comeback?